Archaeologists have found a treasure trove of ancient artifacts at a dig in the southern Lebanese city of Sidon, including a 4-foot-high (115-centimeter-high) statue of a Phoenician priest dating back more than 2,500 years. 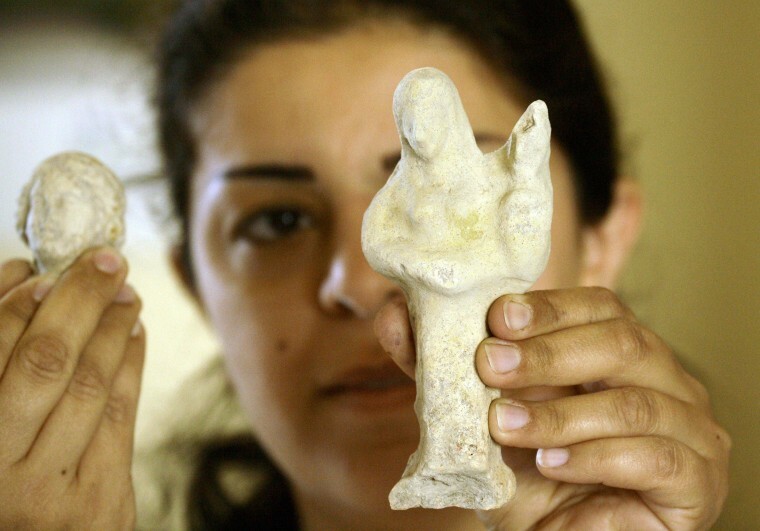 "Nothing comparable has been found in Lebanon since the early 1960s," Lebanon's Daily Star quoted the excavation's leader, Claude Doumit Serhal, as saying. The priest portrayed in the statue is wearing a pleated kilt, and in his left fist he holds an object that experts suggest could be a scroll or a handkerchief. The statue was found at Sidon's Freres College site, which has been under excavation for the past 16 years in cooperation with the British Museum. The Daily Star said the statue had been repurposed during the Roman era and was found lying on its front beneath a marble pavement. Archaeologists also unearthed a bronze representation of the Phoenician goddess Tanit and Roman-era figurines of the goddess Osiris. They found three previously unknown rooms of a public building from the third millennium B.C., plus 20 graves associated with adults as well as infants from the second millennium B.C., according to the Daily Star.